Ah, festivals. A chance to get away from the routine of everyday, to only worry about whether you’re going to get to a stage to see an act in time. To paint yourself in glitter and drink as soon as the sun comes up. A chance to see and experience the day start and end, sunrise to sunset, rain or sun. Surrounded by happy revellers up for a conversation with whoever happens to walk by. We live in quite an individualised world, and festivals for me are a chance to really experience that community spirit, where everyone’s got something in common and no one holds back on having fun. My festival escapades are sadly over for this year, I had a great time at Download Festival in June, and I'm already starting to put money aside for next years festival ventures. I want to go to as many as financially possible, and get my money's worth for my Grand Canyon tent. 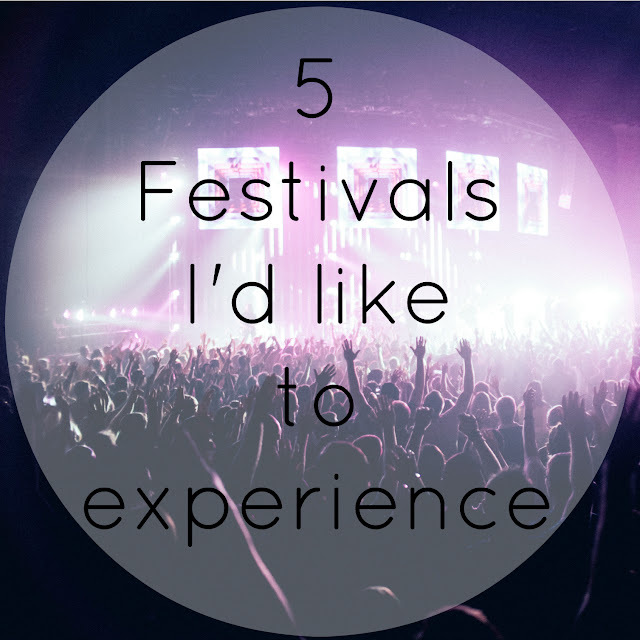 There's just so many festivals around the UK just waiting to be experienced and in this post, I've put together a list of 5 UK festivals I'd love to go to. Held annually in Chelmsford, Gloucestershire with a small capacity of just 5000, this festival is not only well-decorated, it’s also my sort of music. With Slaves and Lower Than Atlantis headlining this year, you can imagine the intimacy and up-close nature of the performances. With a stage set in and amongst the trees, and a friendly, upbeat atmosphere it gives of the impression of what Slam Dunk would be like if it were held in one place over the weekend. Boomtown is set in a dystopian town, nearby to Winchester in Hampshire, with different themed districts from China Town to the Wild West. There’s such a focus on atmosphere and decor that it would be like stepping into another world. Definitely a festival I want to experience at some point, with acts like Madness , Cypress Hill & The Specials having performed there, on one of many stages the festival has, it’s truly seems like a one of a kind experience and a great chance to immerse myself in different genres of music I don’t regularly listen to. Based in two sites, the line-up every year will pull you in in some way, whether it's the headliners, or acts dotted about the line-up - even on 'weaker' years, like this year in my opinion, they've always got good acts on offer and it has such an energy to it. What I especially like about R&L is the variety of acts on offer. Playing host to such big name acts, I can imagine there would be some truly horrific set time clashes, but it’s one I wouldn’t want to miss. Personally, I wouldn’t want to pay some of the staggering fees to see 'A-list' artists, and V Festival would be a great opportunity to see many of them for a fraction of the price to see them in concert. I'd love to experience a pop festival and I'm hoping Kesha will go to one in the UK next year. I've also seen that BBC are playing to do multiple events next year in place of Glastonbury, so I'll have to keep my eye out for that too. Coventry has it’s own festival held within the city, and its free. Yes, completely free. Advertised as family friendly, the festival has no camping area, but with a Premier Inn nearby it’d be well worth it. Acts that performed this year include Example, Pulled Apart By Horses and Mallory Knox amongst many more across three days in Coventry’s Memorial Park. Oh, and last year, when I couldn’t afford to go to a festival - wait for this…just wait - IT TURNS OUT NECK DEEP WERE THERE AND OH MY GOD IT WAS FREE AND THEY DID LIKE A TWO HOUR SET AND AAAAAH. This is a festival I’m definitely keeping my eye on next year, and if there’s acts that I want to see, I am booking that Premier Inn room and wingdinging myself straight to Coventry. So, those are the festivals I'm keeping my eye out for next year, I'm interested to know though, what festivals have you been to? What were they like? Or what festivals are you considering? I approve of your taste in music! LTA and Mallory Knox are amazing. I've never stayed overnight at a festival though, not sure I'd cope! I love the idea of 2000 Trees, I've never been but it's sounds right up my street! I bloody love Mallory Knox too, such a great band. I'll probably go to Slam Dunk next year and maybe do a day or two at Leeds Fest - I can't hack camping so I need to pick wisely!